Web Sites. Build it and they will come! Search Engine Marketing. Use it with your PR Marketing. Millennials. Do you know the interactive marketing rules to reach this group? 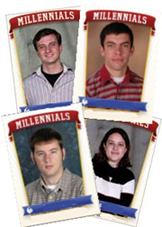 Is your publicity or ad campaign for your pr client reaching the millennial generation? This group is more sophisticated than previous generations about marketing and internet marketing. To reach them, you need to follow their rules. A typical public relations service campaign is not going to work. PR clients need to learn their rules and only then will corporations be able to get their products into the hands of the “millennials”. So what are these rules? I saw an article in iMedia Connection by Krisserin Canary who explains the rule. And she should know, being a millennial herself. These are a short summary of her article. Read the entire story to get the full insight. 1- Get their attention. This group since birth has been told they are “special” and “unique”. This created a generation of “needy” and “entitled” humans. That means they are centered on themselves. So to get their attention, you need to make the pr marketing strategy be focused on what is relevant to them. Non-intrusive interaction. Advertising needs to be interactive, or at best advertise “with” them, not “to” them. Millennials do not like things getting in their way, such as when listening to music, watching a video, or reading a blog or texting. 2- Get them interested. The ad banner, or ad that appears on the internet page must be direct and tells who and what you are. Flashing your logo is not going to work. Explain who and what you are and invite the reader to your site. 3- Take the lead. When they become comfortable with you, take the millennial to places they wouldn’t have gone before and introduce them to your new content. Basically, keep them updated, give them feedback, and speak in their language. Although all this sounds simple and basic, it has been difficult for pr clients and public relations firms to understand this generation. If you need to hire a company to help you create a publicity campaign or an advertising campaign to reach this generation, contact us. We can make things happen for your company. Comments Off on Millennials. Do you know the interactive marketing rules to reach this group?